The synchronized fiveshift-gearbox comes from the well equipped Fiat component system. A more closely gradated transmission was scheduled only for the racers. Homologated should finally the 3,667-2,10-1,361-1,00-0,881-gearbox (rearshift 3,526:1), as extra was a 2,724-1,857-1,351-1,00-0,84-gearbox (reverse gear 2,806:1) available. In addition to the standard 4,3:1-axledrive-translation was a spear-differential shortened on 5,375:1 was homologated. Test drivers criticized a hole that was between the third and fourth shift and fourth was too closely because of the fifth shift. Optimal passage starts at 5200 revolutions; highrevolution driving was thus quite announced. Maximally 7000 revolutions were in it (which corresponded to a speed of approximately 190 hp/h), the red range began with 6400 routes. The second evolution level concerned the chassis, which had to correspond to clearly higher requirements. The well-known rear axle had to leave. Instead of its comes here the Fiat 130, in addition of such speeders like the Lotus elite ago well-known single wheel suspension: Two durable wishbones and Mc Pherson spring struts (coil springs and extended, harder shock absorbers in increased cathedrals) with long reaction thrust props (at the transverse axis welds and in the back linked), to it a transverse stabilizer. The single wheel suspension was certainly not undisputed, even if she high-brought the unspringed masses reduced and the differential more suited: Old Rallye hare's always considered a solid, fixed axle. The lateral drive shafts of the CSA by the way corresponded to those from Porsche 911. Deeply and broad worked the car not only - it was it also: The track width had grown in front by 7 centimeters, in the back by 13 centimeters. The differential, whose edge of plate originates from different subjects of the Fiat component system (2300 Coupé with 10/39, became 1800 sedan until 1968 with 10/43, 241-delivervan with extremely short translation, ideally for mountain running), now held at three fastening spots at the body. From the component system they availed also for the rear wheel bearings: They performed in the Lancia beta their service otherwise in front. The Bendix disc brakes had been insignificantly revised against it. Improved became besides the front wishbone construction - owing to additional thrust props the lower trapezoid wishbone and a transverse stabilizer. The rear single wheel suspension as well as the CSA Differenzial were offered by the way also as Abarth kits on the free market - some of it appeared into the victorious SEAT 1430-championship-sedans. And finally the well-known spider-body was optimized in things like lightweight construction and rigidity. On the one hand it concerned consistent lightweight construction: Punched tail trim shield inside, flat black painted engine and trunk hood from fiber glass, rubber horns in place of bumpers, door outer skins, held by additive breech, sillboardcase, wind guide plate and fender corners in the back from aluminum, extremely more easily inside mirrors, in addition spartanic weight reductions in the interior (no rear seat, no sun visors, no central and radio console, no glove specialized cover, aluminum dashboard, light door inside panelings, punched doorhinge from other material, lighter carpets, no issuing windows, simplified window lifting mechanism). The hand grip on the driver's side by the way originates from the Fiat 500, the rear licence plate light from the Fiat X1/9. In addition there's a tank quick-locking mechanism (as with the Fiat 850 Spider) with short, direct inlet to the tank container, leather steering wheel Abarth type Lusso as well as in series completely normal 124 and/or 128-Coupé-seats. 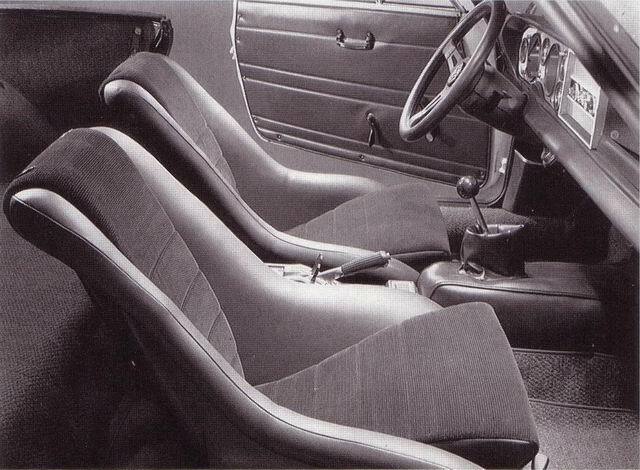 Most buyers ordered the optionally available Cordsamt referred Recaro podseats with fourpoint belts. The Veglia Borletti instrumenting remained the same as in Spider. To three quarters were the approximately 100 kilograms compensated, apart from the excess weight by the complex rear single wheel suspension, by the Hardtop fastened by means of vierer clamps and four screws and the rollbar. The Hardtop - without rainwater gutter, but with Perspex back window - failed more easily than the roof for Series-Spider and was referred with special linen made in India. It could be decreased after loosening of the four clamping catches and the rear screws problem-free, was thus by no means inseparably connected with the body. Some CSA owners use in summer a softtop, for whose installation only three screws at the rearwall and two further behind the doors must be attached.